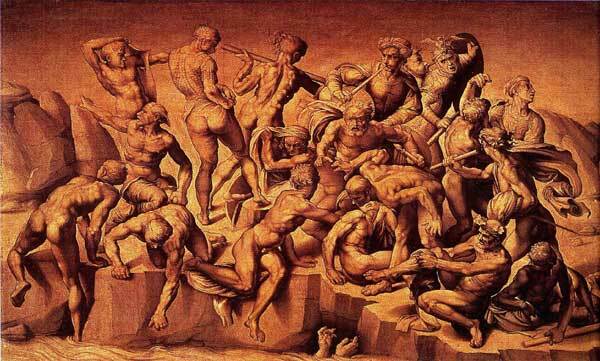 The Battle of Cascina Michelangelo's unfinished masterpiece. The Battle of Cascina took place on July 28, 1364, and celebrates the Florentine victory over its bitter rival, Pisa. The Republic of Florence had decided to decorate its prestigious new hall of state with paintings on a grand scale (at the time of the commissions in 1504 Florence and Pisa were still locked in conflict and dispute). Two of the most influential artists of the day, Leonardo da Vinci and a young Michelangelo Buonarroti received commissions to fresco battle scenes for the state hall. This was intended to extract the highest level of effort from Leonardo and Michelangelo by placing the two greatest artists of the Renaissance era in direct competition with each other. Aristotile da Sangallo. The Battle of Cascina c. 1542. Both Michelangelo and Leonardo failed to finish their battle scenes. Leonardo had technical difficulties and Michelangelo was summoned to Rome by Pope Julius II. 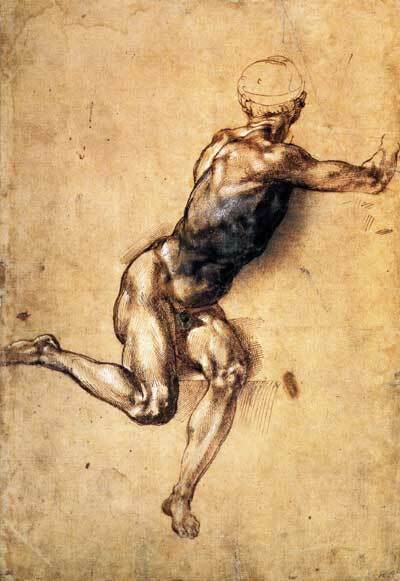 It is clear from Sangallo's copy that, even at this early stage of his career as a painter, Michelangelo was very drawn to the representation of the male, naked form. The scene is the central part of Michelangelo's fresco. The Florentine army went into the river Arno to bathe and escape the heat of the day. Fearing that the soldiers would be caught off-guard by the enemy, the Florentine captain raised a false alarm. The soldiers rush to dress and arm themselves in a chaotic and un-gamely manner. This is not the heroic Florentine army defeating the forces of its rival city of Pisa. It seems almost unsuitable as a statement of the power of the Florentine Republic. However, it must be remembered that this is just one part of Michelangelo's intended vision for a fresco that, had it been completed, would have been one of the greatest works of the Renaissance. Study of a Seated Figure. Michelangelo. pen and chalk, British Museum. London. We can see, from this Michelangelo study, how faithfully Aristotile da Sangallo has drawn on Michelangelo's vision of the battle. (compare the central figure in Sangallo's copy with this study). Michelangelo's Battle of Cascina and Leonardo's Battle of Anghiari, although never completed, had a huge influence on successive generations of artists. The preliminary drawings and cartoons have been copied many times, what a pity that we can never see the works of these two Renaissance giants within the Florentine State Hall.